So for bedrooms... I went through this "got milk?" phase and was collecting all of them from any magazine I could... I *think* that's Brian from BSB to the left of the mirror.. and a save the dolphins poster... and on the dresser on the right is an original bath and body works body spray in vanilla? Annnnd Tweety bedding. Ugh. I was a mess. lol. These pics are from 1994 when I was 16. 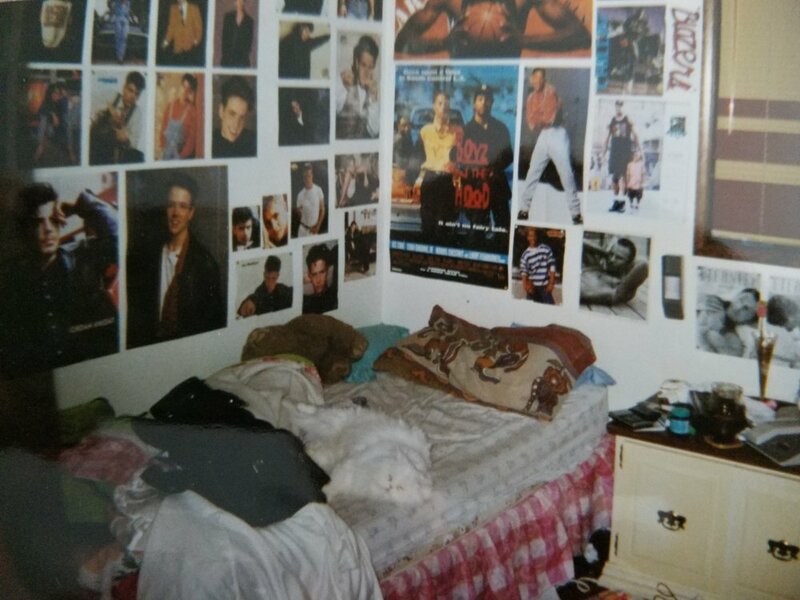 It was after the "wallpaper your entire room" phase of 1990, but obviously I still loved my posters. I was the last New Kid fan standing...that I knew of anyway. I loved the Face the Music era! The funniest thing is the poster of Snow, do you remember the song Informer? Too funny! I saw the post about rooms and that you want to know the favorite thing. I would like to say it would be my Joe pics, but really mine would have been my phone and TV/VCR. I would have been devastated if those went away! Those were the days when you came home from school and talked on the phone for hours and stayed up late to watch Arsenio. Sorry to my friend in this pic, but its pretty cool, so I thought I'd post it. She wasn't a NKOTB fan, but she is hanging out in my room, looking at the NKOTB bubblegum tapes! 1990 or 1991.